The 360 Account Or The Bonus Saving Account If You Have $25,000? You are here: Home / Make Money With / The 360 Account Or The Bonus Saving Account If You Have $25,000? If you have been checking out the local news lately, you would have noticed that one of the local bank (starting with O) has just launched a new Savings Account called the 360 Account whereby you can get up to 3.05% per year when you save and transact with the bank. Before this launch, there was another local bank (starting with S) which has started this trend and has a rather similar savings account whereby you can get up to 1.88% per year when you save and transact with the bank. I was sharing the news of the 360 Account with my friends and that they should consider starting one (or to convert from their current Bonus Saving Account) to further boost their savings interest rate while still maintaining their current spending /saving lifestyle (or a bit of lifestyle changes to get the most benefits). It was until one of my friends highlighted to me one of the features of the account that prompted me to do this post (note that no banks have paid me anything to do up this post) and to do my own calculations to determine if this 360 Account is still considered the better choice. 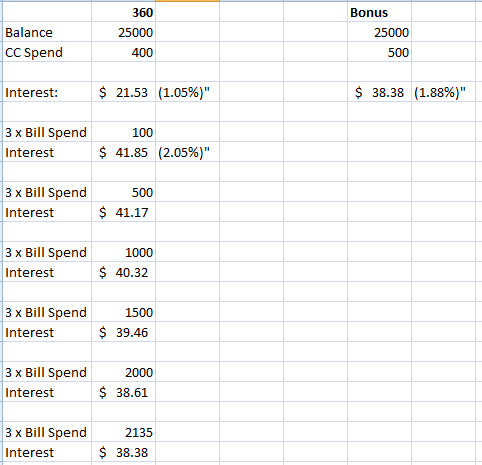 If they spent way above the minimum $500 Credit Card Amount (for the 360 Account) because of the 3 Bills they need to pay… will the interest earned from the 2.05% per year be lower than the 1.88% per year (for the Bonus Saving Account)? If you just spend on the minimum for the credit cards, the Bonus Saving Account is definitely the better choice. There are definitely many other kind of spending / saving combinations but based on this current assumption, there is definitely a little bit more interest to make every month if you are to stick to the 360 account. The only few hassles here are that if you choose not to credit your Salary here, you have to make the effort of inter-bank transfer for the payment differences every single month. So if you are thinking of growing your current savings and you are not those risky types to go into investments, you may wish to explore this 360 acc0unt today! But if you have certain spending / saving combinations you would like me to try out and compare… please feel free to drop a comment or through my contact page and I can do up something and share it with the rest of the readers! Are You Depending On Your Bank Savings Account For Your Retirement?